Hi, friends! Fall is in full swing over here in our part of the world, so naturally, we have one thing on the mind: comfort food. 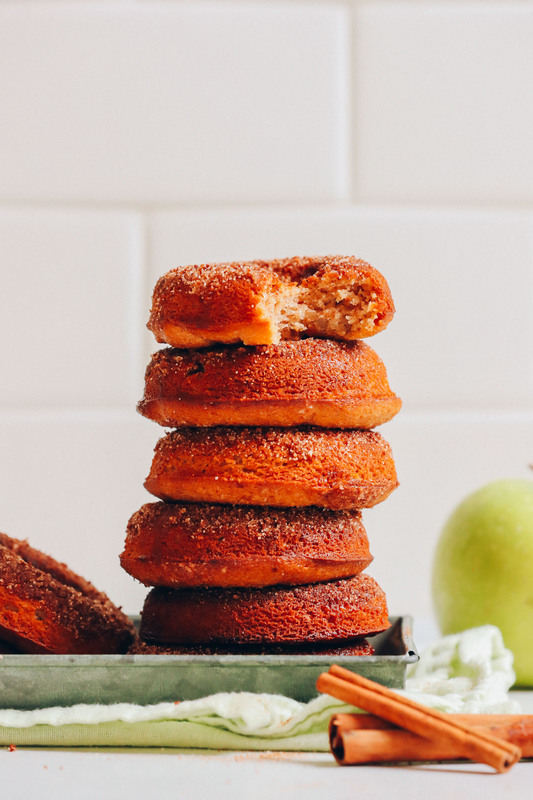 And nothing spells comfort food like these baked apple cider donuts. Consider them a hug from fall. Let’s bake! This 30-minute recipe starts with aquafaba! Aquafaba is the liquid from a can of chickpeas, which whips nicely and mimics the properties and texture of egg whites. This not only acts as a binder but also helps the donuts stay light and fluffy! 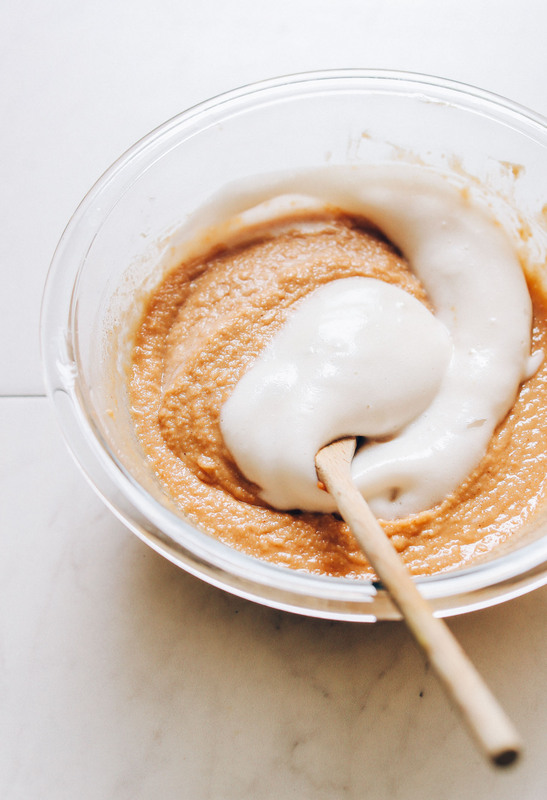 Once whipped, set aside and prepare your simple batter, which is comprised of wholesome ingredients like almond flour, maple syrup, coconut sugar, and our gluten-free flour blend. 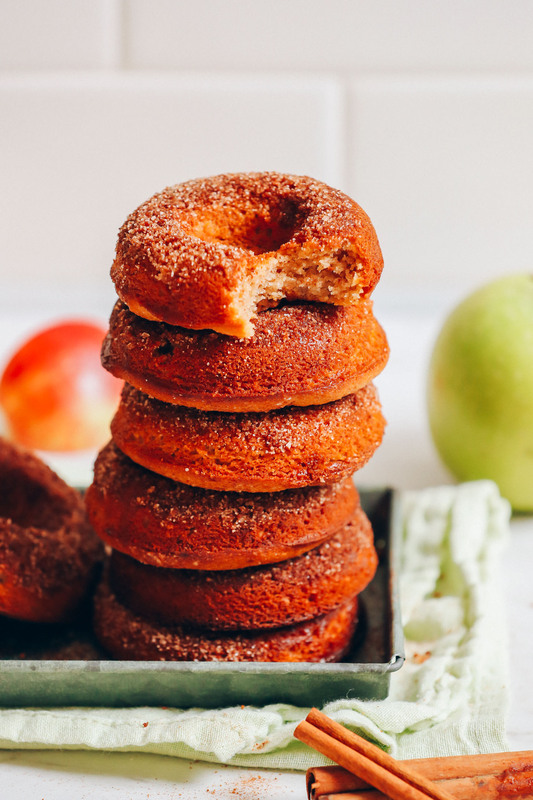 These donuts get infused with apple flavor two ways: 1) applesauce, and 2) apple cider! Throw in some warming fall spices like cinnamon, ginger, and nutmeg into the mix and it’s like a baked apple dream. After a short bake in the oven, it’s time to invert and let cool slightly to firm up. At this time, you can brush your donuts with melted vegan butter (or coconut oil) and dunk them in a cinnamon-sugar mixture! This adds a little more texture as well as sweetness and warmth. Swoon! This would make the perfect slow-weekend breakfast treat. Or you can make them in advance to enjoy throughout the week with coffee, this Healing 3-Ingredient Turmeric Tonic, or a Matcha Latte! If you like this recipe, also be sure to check out our Chocolate Baked Vegan Donuts, Apple Pie Crumble Bars, Cinnamon Baked Apples, and Caramel Apple Cheesecake Tart! 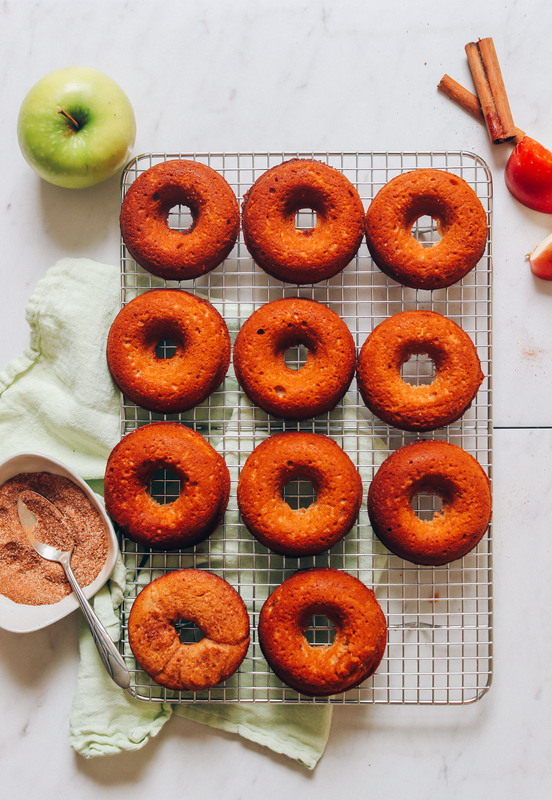 Fluffy, apple-cider-infused vegan, gluten-free donuts! Naturally sweetened, about 30 minutes from start to finish, and perfect for fall! Preheat oven to 375 degrees F (190 C) and grease two 6-slot (or one 12-slot) donut pans*. To a large mixing bowl, add the oil, cane (or coconut) sugar, maple syrup, vanilla extract, cinnamon, sea salt, ginger, and nutmeg and whisk vigorously to combine. Then add applesauce and apple cider and whisk once more to combine. Add almond flour, gluten-free flour, baking powder, and baking soda, and whisk gently to combine. Lastly, add in the whipped aquafaba and gently fold in, trying to be as gentle as possible (see photo). If the batter appears too thin at this point, add 1 Tbsp each almond flour or gluten-free flour at a time until it thickens up. It should appear like a thick cake batter - semi-thick and more scoopable than pourable. Divide batter evenly between donut tins, filling all the way full but leaving room for the center hole to be exposed (this can be done using a piping bag, Ziploc bag with the corner cut off, or just a spoon). There should be 11-12 donuts (amount as original recipe is written // adjust if altering batch size). 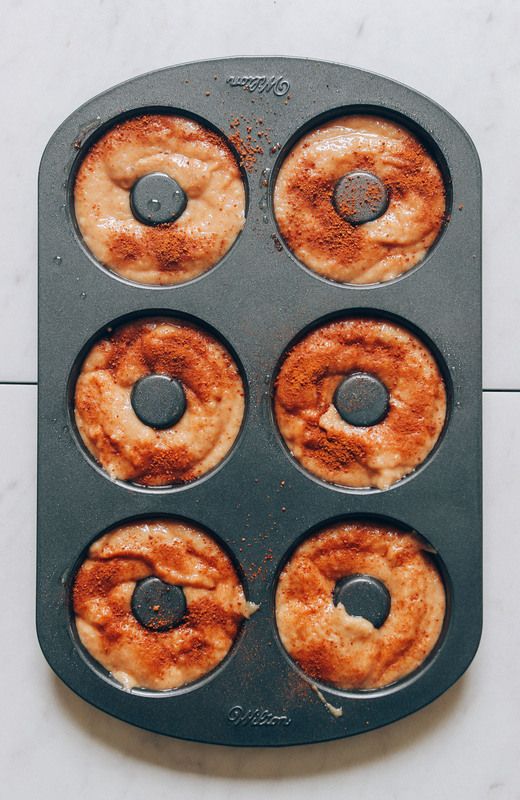 Optional: Sprinkle the donut batter with coconut sugar and cinnamon before baking. Bake for about 20-22 minutes or until a toothpick inserted into the center comes out clean, the edges appear brown, and the tops appear dry and fluffy. Time will vary depending on oven and if you subbed ingredients. Optional: In the meantime, melt vegan butter (or coconut oil) in a small dish and prepare cinnamon-sugar coating by adding cane or coconut sugar and cinnamon to a small dish and stirring to combine. Set aside. Remove donuts from oven and let cool for a few minutes in the pan. Then grab the tins with a towel and tap over a cooling rack to loosen the donuts until they fall out. Let cool (smooth side up - the side that was in the tin) for at least 5 minutes on the rack. The longer they cool, the more they'll firm up! Optional: While cooling or once cooled completely, brush the donuts with a light coating of melted vegan butter (or coconut oil) and dip in or sprinkle with cinnamon-sugar coating. Best when fresh. Store completely cooled leftovers loosely covered at room temperature up to 3-4 days or in the freezer up to 1 month. *We tried using flax seed in place of aquafaba and it didn't turn out nearly as fluffy. If not vegan, you could also sub egg whites for the aquafaba. *We recommend using Wellbee's brand almond flour as it works best. If you are nut-free, you can try subbing another seed meal, such as a blend of flax, sesame, and sunflower. We don't recommend oat flour - it turned out a little gummy. If using coconut flour, halve the amount, as it is quite absorbent. We haven't tested anything other than almond flour though and can't guarantee the results. *Nutrition information is a rough estimate calculated with avocado oil, coconut sugar, and maple syrup and without optional ingredients. We have a winner! Turned out exactly as pictured and described. Of the dozen we had a few that didn’t immediately get eaten. Third day I put them in the toaster oven at 325 for 5 minutes or so and voila! Fresh donuts! Thanks for the great website! Hello Dana what would work instead on apple cider? We don’t really have that in UK, can I just add some water or almond milk? Hi Monika, you could try using lemon juice or distilled vinegar. Hope that helps! Hi Monika, so glad to hear they turned out! Thanks for sharing your experience! Dana, I just got back from the Doc saying I have to be a vegan and GF to become pain free. I was so upset because the cook books were loaded with unusual ingredients and flavor combo. I’m old and set in my ways. THEN I found you! I can get healthy cause you have food that I love to eat….and I am speechless. Thanks for doing this!! That’s because your putting vinegar in the recipe. Instead of cider. These are sooooo good!!!!! We all loved them. I tried to cook some of the batter in an ebelskiver pan but decided it is too thick; but it works great as donuts! The aquafaba is amazing. Thanks for your fabulous recipes and pictures! These turned out awesome! I used the nut free suggestion and subbed almond flour for 1/2 ground sunflower seeds(used vitamin) and 1/2 flax meal. Thanks Dana!! Great! Thanks for sharing, Sabrina! Yummy and very soft & fluffy! My first time with aquafava and I am impressed. Recipe did work in a muffin pan, since I didn’t have the donut style. Next time I would decrease the apple cider vinegar a smidge, I could taste a bit too much of the flavor for me, however my friends didn’t notice or mind! This is a try again forsure! I have a question. I made this once before and they came out perfect. Absolutely perfect. However, the last two times I have made them, they have stuck to the pan and came out in pieces. I tried cooking spray first then coconut oil this time to “grease” the pans but both times the same thing happened. I was able to resurrect them a bit by crumbling the pieces into a bowl and adding vegan melted butter until I was able to mold them into donut holes. Then I rolled them in the coconut sugar/cinnamon mixture. They were great but we still want to eat them as donuts! Any suggestions? Five star excellent recipe. I made these for Thanksgiving and they were a huge success and went way too fast. Thank you Dana for your simple yet very delicious recipes. Being gluten and dairy free it is such a treat to really indulge in something so yummy. I made the donuts again this morning followed by a homemade hummus recipe with the opened can of garbanzo beans. Excellent… a little too excellent. I could see myself eating the whole tray! We made them in a muffin tin and they were wonderful. We used melted coconut oil, but due to the temperature of our house we had to act fast cause it was firming up. Thanks for sharing the awesome vegan recipe. I cooked this recipe yesterday at my home. My husband loved it very much. Keep Sharing such kind of awesome recipes. Dana, thank you so much for sharing your amazing recipes with the world. I am 36 and have been healing from serious chronic health issues for the past 5 years, with going mostly vegan/gluten free as a part of the the healing process. My husband has been dealing with some health issues as well and has helped me stay on track with our diet by making it a lifestyle change as well. Every time I make one of your recipes, he says “is this Minimalistic Baker?” You are my go to for new recipes because we haven’t tried even one that we weren’t crazy about! We appreciate you so much and this recipe is one of our new faves. Thank you so much from the bottom of our hearts (and bellies!) When you share your passions with others, you never know just how many peoples lives you touch in a positive way! We are so glad that the site has been helpful for you and your husband, Lindsay! Thank you for the sweet note! This is definitely a new favorite recipe! I’ve made them twice already and both times I had guests ask to take some home with them. Pretty much the only recipe that takes me the as advertised time to make – only 30 minutes! I even doubled the recipe for one batch and still perfect, I used the cream of tartar liberally to “stiffen” the aquafaba but it didn’t seem to matter if it didn’t firm up much. I have a lot of pumpkin puree left over from Thanksgiving. Any thoughts on how I could sub in some of that into this recipe? This recipe is out of this world!! By far the best donut recipe I have ever made. I didn’t have apple cider on hand and the only purchase option was a gallon container of apple cider, so instead I bought a small bottle of sparkling apple cider and it worked perfectly!! I haven’t tested it with regular apple cider, but I think it made the donuts extra fluffy! Yum! These are delicious. Will be making this again soon. I think the Apple cider and/or Apple butter add a lot to the flavor of these doughnuts! I had known that applesauce is a great substitute for fat, but I had no idea that the liquid from chickpeas mimic whipped egg white. Truly delicious and easy. Thank you. P.S. I made muffins; will get a donut pan. The more you know! We hope you enjoy the recipe, Sheila! Great! Thanks for sharing your process, Elizabeth! Do you think I’d have any issues if I mixed everything up the night before, left it covered in the fridge overnight, and then baked them in the morning? I don’t think so! Let us know if you give that a try. I froze aquafaba into ice cubes for later use. Do you know if I thaw the aquafaba cubes if that will still work or should I use fresh from the can? I haven’t tried that, but think it should work. Let us know if you give that a try! Hello Dana, I made these for a lazy Sunday breakfast yesterday. I used whole grain spelt flour, a pealed a fine grated apple instead of the applesauce and made them in a muffin tin. Next time I will try them with orange juice and a chocolate glaze. And I have to buy the doughnut tin. Finally! Yay! Thanks so much for sharing, Cosamea! The moment this recipe popped into my email subscriptions, I knew I was going to make it. 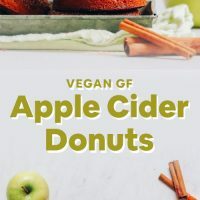 I’ve been all kinds of excited for all things apple cider but I haven’t seen a vegan and gluten free donut recipe that works. Thank you for creating such a great donut! Also, I made these with the following modifications: I used 1/2 cup brown rice flour and 1/2cup tapioca starch in place of the gluten free flour. I also used my almond milk pulp (dehydrated) for the almond flour. I halved the maple syrup and used an extra 1/4 cup of applesauce. I omitted the oil because the batter seemed wet enough. Lastly, I had a hard time whipping the aquafaba and by the time I added it to my batter it was flat again. Oh well, the donuts still tasted good! It was a little tricky to come up with all of the ingredients but I am very satisfied with the taste! Thanks for sharing your experience, Melanie! Yum! Made these this morning and they turned out delicious! It was hard to wait for them to cool off, but it was well worth the wait!! Made the attached gluten free flour mix for the first time and it worked great!! Whoop! Thanks for sharing, Andrea! I love these!! I’d like to try it in a load pan to make an Apple Cider Donut/Bread loaf. What would be time and temperature difference that I would need to bake it at? Thank you so much for this delicious recipe!! Hi Erin! We’re thinking any mini bundt pan or probably muffin tin will work! Just grease well to prevent sticking. See comments above for tips from others that have tried this. Good luck! Mine turned out a bit darker but they were quite tasty. I think I also should use the cream of tarter to firm up the aquafaba. I will try this again. Can i use all almond flour instead of the gluten free flour blend as i have someone who is on a paleo diet? We haven’t tried using just almond meal but if you experiment with it, report back on how it goes! These came out excellent in texture and flavor. I did not need to add the additional 2T flour. I also did use one egg instead of aquafaba. Thank you for another outstanding recipe! Definitely misread the directions and used ACV instead of apple cider. Still turned out amazing. This looks DELICIOUS. I’ve just recently become vegan and I’m on the hunt for yummy dessert recipes that don’t look too daunting for a very amateur baker. Definitely going to attempt these. I also need to get to grips with using aquafaba… wish me luck!! Jessica, on you tube, in the search engine put aquafaba recipe, and be prepared . Your going to love all the great recipes, and techniques. Pinterest to. Hi! This may be a dumb question but do you think almond Meal would be ok instead of almond flour? Not a dumb question. Unfortunately it won’t work *as well* as almond flour, but yes it should work in terms of texture. I favor almond flour in this recipe (and many others) because it’s more neutral in flavor, has a “cakey” taste to it, and the texture is light and flour-like. Made these tonight and they are the most delicious donut recipe I’ve ever tried!! I made this for my kids (all under 9). After they are their dounuts they started all yelling from the other room, “Rate these 5 stars!” We all loved it. I had to sub ground walnuts for almond flour, but it worked great! It was my first time using Aquafaba– so easy. It was a treat to make and to eat! Thank you! I’m not sure where to put this question, so I’m just leaving it here even though it’s not related to this specific recipe. Have you ever posted your typical weekly grocery list? I’d love to see what your shopping cart looks like. Good question. I haven’t yet! But we’re planning something like that for the new year and will be sharing about it soon. Stay tuned! would all purpose gluten free flour be okay instead of almond and the flour blend? I think that should work but we haven’t tested it. Let us know if you do! I was thinking this same thing. Would love to know if it worked! I may try this recipe for Thanksgiving, so I’ll be sure to post my results if I try it with the all purpose gluten free flour blend I have on hand. I simply love your recipes and this one is no different, made them today with homemade applesauce, ground pecans and a few pureed dates thrown into the mix for fun. Delicious! Thank you from Australia! Ah, thanks Lisa! So kind! Ohhhhhh!!! Pecans?, mmmmmm!!!!!. Dates!!!!! Omg, my two very favorite snacks, when I’m not strictly WFPBSOS. I’m doing it. Don’t have cider, but a few apples juiced will do. I have a donut pan, but it’s been packed away, maybe I can find it, but I’ll let everyone know how muffin tins work if I can’t find the donut tin. You all have such great ideas. I feel like I’m amongst a great group of bakers. Would this recipe work in a muffin tray? I think so but we haven’t tried it. Let us know if you do! Loved this recipe! I didn’t have apple cider (couldn’t find at the store), so I used 1 cup of apple sauce and I forgot I had just finished off my baking powder so I squeezed half a lemon and a total of 1 tablespoon of baking soda for the recipe. They came out moist, super tasty and best of all a donut!! Thanks for your great recipes! Lovely! Thanks for sharing, Elyse! I followed this version too- used 1 cup applesauce and no apple cider and 2 ener G “eggs” instead of the aquafaba. The batter was a little thicker than I expected, which resulted in less smooth donut tops, but the end product tasted great!! Can I replace the aquafaba with something else? Check the comments above for more recommendations, but in short, I think flax eggs would work or – if not vegan – egg whites (or whole eggs) should work as well. Could I use honey instead of maple or agave? You totally read my mind – was going to develop my own this week, but you beat me to it! Will have to try these. YUM. That’s all I can say. 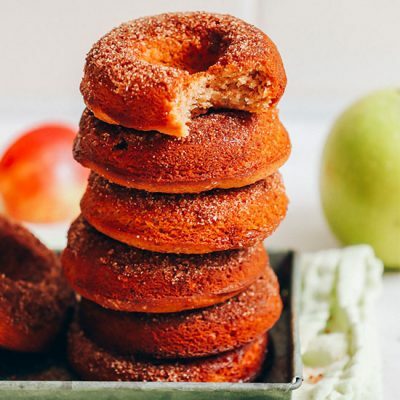 I have never had an apple cider donut before so I have to try this recipe to see how they turn out! With 7 people in our house with varying dietary needs, we are plant based /gluten free and your site is my go-to for all things delicious and baked. (Virtual bow) Everyone just asked me yesterday for some apple cider donuts and I was about to experiment this week. Then… Hallelujah! You saved me time and energy once again! (Virtual fist pump). We are making them today! Thank you!!! I saw this recipe and it just seemed like the perfect thing to make since I was using chickpeas for another dish (which would supply the aquafaba) and some apple cider that needed to be used up. I am not going to rate the recipe, because I had to make a few changes and I would like to try it as written before I rate it. I used half applesauce and half apple butter as suggested, I believe that added wonderful flavor. I have a “pie spice” mix that I used instead of the spices. The main problem was, I don’t know if I used almond flour or almond meal! I think it might have been almond meal because the finished product did have some “chewy” pieces in it. I also don’t have a donut pan, so I used a mini bundt pan instead. However, it wasn’t greased well enough (all those little nooks…) and I had much trouble getting the donuts out of the pan. Several fell apart in the process, but the crumbs were yummy! I felt that the flavor was VERY GOOD, but the texture was a bit off, too crumbly….I believe to be my fault if it was in fact almond meal. BUT, when I did reheat them today (the day after), the texture improved and they were even better! I want to make the recipe again, making sure I use the right flour, then I can give it 5 stars! Truth be told, I don’t think my kids even noticed that the texture was too crumbly, they just gobbled them all down… When they do that, it’s nice to know that they aren’t deep fried, we avoid those because we try to cut out as much oil as possible! Thanks you Dana for a apple cider donut recipe that I don’t feel guilty eating! Sarah, that’s so helpful. Thanks for sharing your experience! We’re thinking any mini bundt pan or probably muffin tin will work! Just grease well to prevent sticking. Good luck! Hi Dana – these looks amazing! Can you clarify if the 2 extra TB of flour should be added if using all purpose flour? Wasn’t sure if that part was just pertaining to gluten-free flour. Thank you and I love your blog! Yeah! Omit at first and add later if the batter appears too thin to pipe into muffin / donut tins. Good luck! Do you think these will bake well in a muffin pan? I think so! Let us know if you give it a try. how many flax eggs should I use?I don’t feel aquafaba is safe. I’d recommend ~ 2 flax eggs. Let us know if you give that a try! Do you think I can try making these in a muffin pan? I don’t have a donut pan. I know they won’t be donut shaped but will they still bake okay? I think they’d be fine! Just bake as instructed! Can you please give the ratio of eggs ,and aquafaba? You would just measure the amount of egg whites (or whole eggs) and sub it in for the exact amount of aquafaba. With concerns over chemicals leaching from the can lining, advise on alternatives to aquafaba would be appreciated! BPA-free cans or boxed chickpeas are available in most health food stores. Can also be ordered online. The problem with BPA-free(from the research I’ve done) is that we don’t know what they replace the BPA with, and it could be just as bad. Personally, I just cook my beans from dry in the Instant Pot – simple as can be, and takes less than 5 minutes of active work. Soak raw chickpeas overnight and cook in the morning. The liquid is aquafaba. Enjoy! Great info and tips! Agree with either non-BPA cans or cooking chickpeas yourself. Sure – you can always sub the gluten-free flour blend for just about any gluten flour of your choice (such as unbleached all purpose or spelt). Can I just use all purpose flour instead of gluten free AND almond? What does the apple cider vinegar add? Taste and/or consistency? I may be mistaken but I don’t think this recipe calls for any apple cider vinegar. It does call for apple cider and applesauce, though. Glad I saw this was going to use Apple cider vinegar. We just updated the recipe to make it more clear. Hope that helps! The recipe calls for apple sauce and apple cider .., I think is vinegar. Don’t put apple cider vinegar in this. As anon said, apple cider is different. It is a sweet beverage. 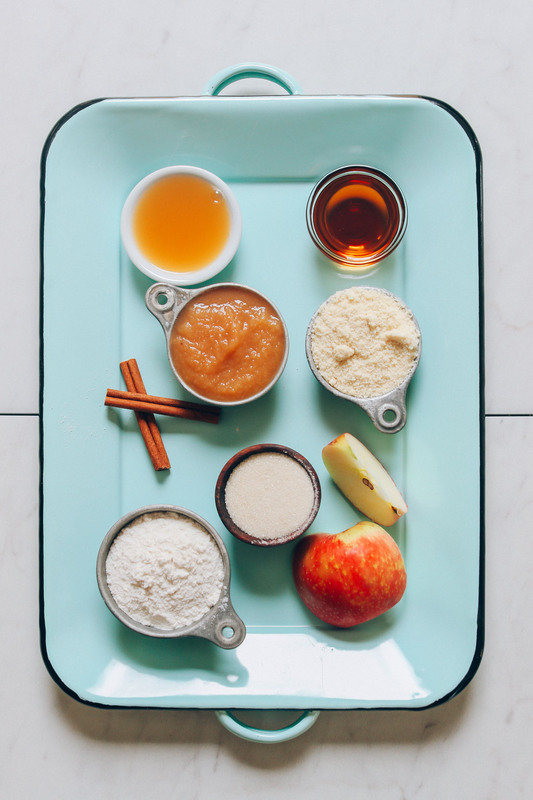 Yes, to clarify, no apple cider vinegar, just applesauce and apple cider (or juice)! Hi Janina! We didn’t test it other ways, but are pretty sure a flax egg would work (won’t be as fluffy, but will bind). Or, if you’re not vegan you can sub egg whites for the aquafaba. Let us know if you give any alternatives a try! Whoever tries this recipe with a flax egg first plz comment results! P.S. 1tbsp ground flax to 3tbsp water. Oh no! Didnt see that she responded. Oops!